We all know that during lent, we focus on prayer, fasting, and alms-giving. Here are some fun ways to help children understand prayer and to encourage them to pray more often. 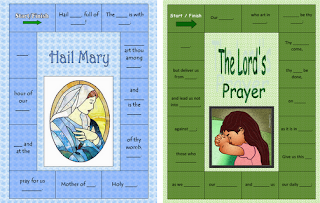 On I Blog Therefore I Am, find these Prayer lesson plans and ideas for Pre K-K. This adorable Prayer Bear is just the tip of the iceberg for cute prayer ideas! Also find vocabulary, children’s prayer songs, crafts, games, snacks, coloring pages, and more! 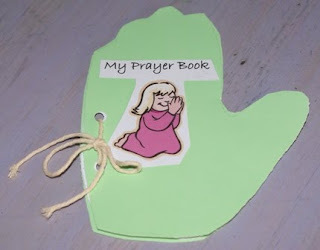 I found this adorable prayer book at Toddler Activities at Home. I love this prayer intention board from Catholic Family Vignettes! on every page to show a prayer intention! Here’s a cute idea for a prayer garden from Two Shades of Pink. If anyone is interested in a prayer lesson for older kids (1st grade on up), here is one they might like. Lacy, you always have such great stuff on here! I actually have a request. It doesn't exactly fit into any liturgical season, but I was wondering if you've ever done a post with responsibility charts? My 5 year old daughter and I are working on that virtue this month, and I wanted to print something for her to put on the wall, but I haven't found anything I like. I'm working on making one for her, but I figured I'd see if you had anything before I re-invented the wheel =) Thanks!!! Hi Lacy! I posted a post for your Lent Link Up! Thanks so much for all you do,it's wonderful!!! Thank you so much for featuring my prayer garden. Spring is coming and I need to implement this idea again for both my girls. I will grab your cutie patootie button too! You are awesome!